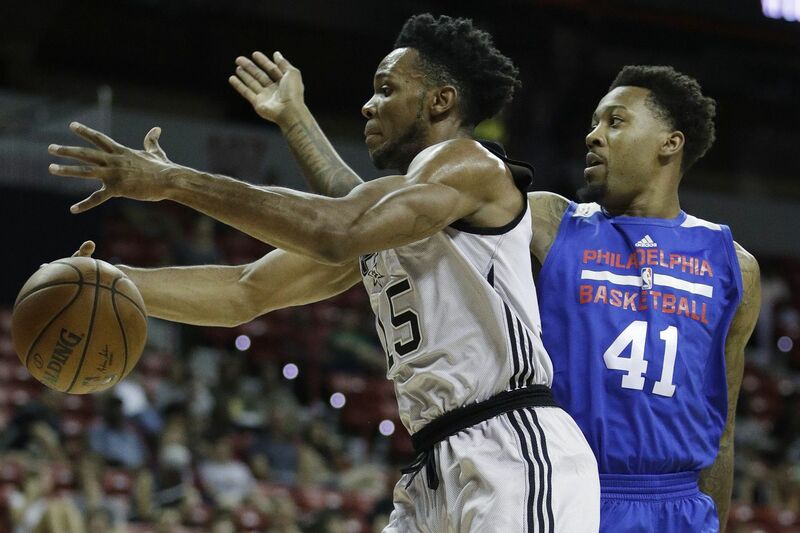 Isaiah Miles (right) has been averaging 11.7 points and a team-leading 8.3 rebounds in NBA Summer League play. LAS VEGAS — Isaiah Miles hopes the 76ers will have something to offer him. The former St. Joseph's standout played overseas the past two seasons. Now, he wants to be a part of the NBA organization he followed closely during his days at the Big Five school. "That's my dream to play there," Miles said. "I've been to college there for four years. I'm from Baltimore, so it's an hour, 30 [minutes] away. I'm a big momma's boy. So it would be great for her to come and see one of my games. It's been two years since she's seen me play in person. "So I'm looking for that opportunity." And he's playing like someone determined to get one. Miles has been arguably the most consistent player on the Sixers' summer-league team. He has outplayed Jonah Bolden and Chris McCullough, the most-touted post players on the roster. McCullough was the 29th overall pick by the Brooklyn Nets in the 2015 draft. The Nets traded him to the Washington Wizards on Feb. 22, 2017, and he became an unrestricted free agent July 1 after the Wizards declined to pick up the fourth year of his contract. The Sixers drafted Bolden in the second round (36th pick overall) last summer. He spent this past season playing for Maccabi Tel Aviv because the Sixers didn't have a roster spot for him. Bolden said July 5 that he'll play for the Sixers this coming season. However, the unheralded Miles is the primary reason the Sixers (1-3) will face the Milwaukee Bucks in an NBA Summer League second-round playoff game at 8:30 p.m. Saturday at the Thomas & Mack Center. The 6-foot-7, 220-pound power forward got his first summer start Thursday. He responded well, scoring a game-high 20 points in an 88-86 playoff win against the Phoenix Suns. The sharpshooter made 6 of 8 three-pointers en route to shooting 7 for 10 overall. He also had six rebounds and one assist in 27 minutes, 47 seconds. "Big props to my teammates, finding me when I was open," Miles said. "That was a big thing, and just shooting unconsciously." Isaiah Miles, right, has been standing out for the Sixers in the NBA Summer League. In three appearances, Miles is averaging 11.7 points and a team-leading 8.3 rebounds. His scoring average ranks second on the team, behind Furkan Korkmaz (15.8). This is Miles' second straight stint with the Sixers' summer-league squad. After going undrafted in 2016, Miles played for the Dallas Mavericks' summer team. Then on July 23, 2016, he signed a contract to play for JDA Dijon Basket in France. Last summer, the 24-year-old signed with Usak Sportif in Turkey. However, he played only 16 games there because of an alleged lack of payment. Miles says the club still owes him money. He's considering playing in the NBA G-League this season. That would provide him an opportunity to get called up to an NBA team. Based on his performance here, he would a great candidate to play for the Delaware Blue Coats, the Sixers' G-League affiliate. The Sixers can sign him to a two-way contract. Under that scenario, the Sixers would be allowed to bring him up to the NBA roster for a maximum of 45 days. After that, the Sixers would have to sign him to the 15-man roster or send him to the Blue Coats. He thinks his summer-league performance confirms to the Sixers and other NBA teams that he's a hard worker and a good shooter. "Shooting isn't my only aspect," Miles said. "I rebound, and I really worked on my defense over the past few summers. So I'm more than just a shooter. Hopefully, they will be able to talk about that."